The day Google launched the Plus One ( +1) buttons, I was having a meeting with our SEO team at [x]cube and I said Plus One is definitely going to be a factor in search results very soon. Whether you are a blog or a website, there needs to be a way for you to integrate Plus One button and entice your users to plus one for you. I had similar discussion with few of my other SEO friends too and not many of them agreed to the fact. One of the few reasons I received against the point was that it is too obvious, this could not be applicable for all types of sites because corporate websites are not likely to get Plus Ones compared to blogs and that Google would probably not like to get into another controversy of pushing their own product based on their search dominance. The way search technology has been improving the only way to stay abreast for Google is to involve human intelligence and Plus One buttons are an excellent way of crowd sourcing human intelligence to judge the quality of search results and websites. I think in the recent, Google also consider public shared a web page to get ranked on Google SERP. how the number of facebook like? or twitter tweet? This post just added more to my curiosity, I would appreciate if you would give us more on Google plus,including the benefits to the stakeholders of SEO and internet marketing. 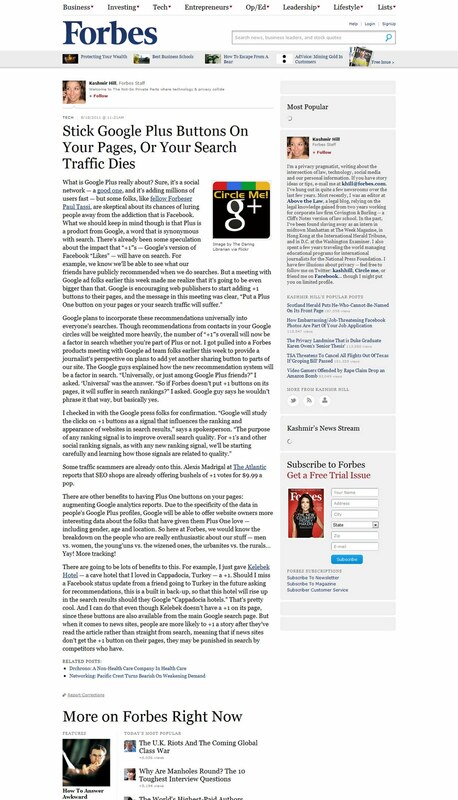 Google+ has changed social media services so far. It is a new dimension of sharing data.. Although Facebook is trying its best to defeat Google+. Lets see who will win……. Wow, I had always kind of figured Google gave itself an advantage, but I never expected them to publicly admit it. The fact that they retracted the article and seemingly covered it up shows they might be in the wrong there. Thanks for grabbing the screen shot! There are really a few nice posts where you can get any beneficial information about a topic. And if we talk about marketing and Fidelizacion, your blog is one of them. Congrats for that. It’s true Karthik. Google is going place a heavy emphasis on it’s +1 buttons. It seems to me that the more your content comes with the +1 button, the more likely it is to show up in Google search results. Having said that, apart from a few very popular brands and bloggers, the +1 profiles of many people seem to be deserted. +1 lets you share recommendations with friends, contacts and the rest of the web when your advice is most helpful – on Google search. I am a novice when it comes to online marketing strategies. But your reviews on google+ has left me gasping. I never really thought that internet can do such things.As I said I am still a novice at the online marketing space and your blog has been a lesson for me. I also think that plus 1 is very effective in social circle. It’s impact full. As per my concern Google+ is very effective social media site. No doubt its very good for SEO purpose but for social networking purpose its very-very good.